Yo-Shiatsu – based in Islington, London – offers Zen Shiatsu and Zone therapy treatments, a derivative of the ancient Japanese Shiatsu massage. 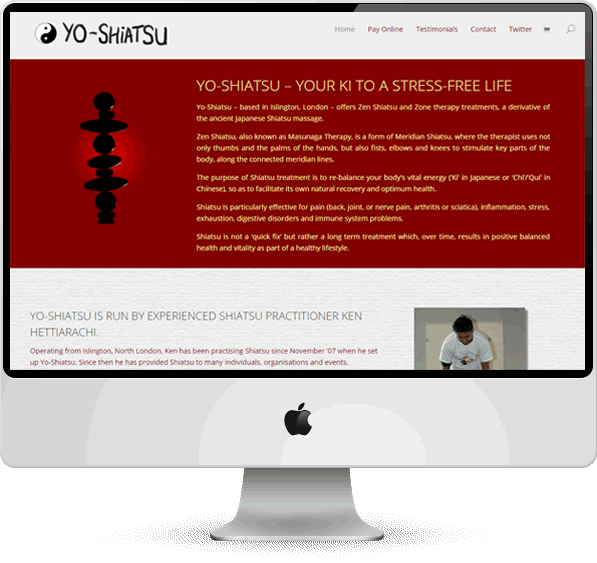 The yo-shiatsu.com website is an example of our BlackboxStore web package, as it incorporates e-commerce functionality that allows visitors to pay for a variety of shiatsu treatments online. It uses integration to the PayPal™ payment gateway, and incorporates automated customer email facilities to confirm payment. You can see the live yo-shiatsu site here.